We’re gearing up for a St. Patrick’s Day party! Our tweens came up with a punch but they need help with a name! VOTE for your favorite name by leaving a comment below. Oh and don’t forget to make it. According to our tweens, “Es delicioso!”. In a large bowl combine the ginger ale and pineapple juice. Scoop the lime sherbet into the mixture. Top with lime and strawberry slices. Serve with a ladle. 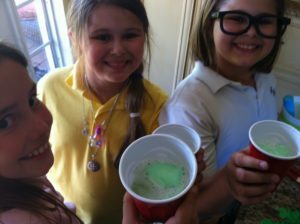 Mean Green gets my tween’s vote but I like Rocking Shamrock!